Commodore's Cup to be held this Weekend. 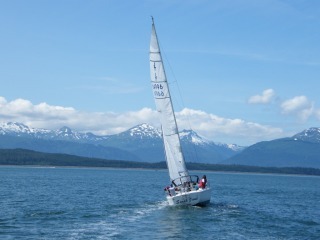 Juneau Youth Sailing is looking for help, racers, and is holding another sailing seminar for SEAS members this Saturday (August 8) starting at 10:00 am and lasting until about 4:00 pm. It is great to get as many SEAS members out there to show our support of Youth Sailing. They need help and encouragement, plus I guarantee there is some really good crew available at these events. So please, if you would like to sign-up send me a note. Remember not only is this a great chance to support sailing, you can probably participate in the seminar that the JYS instructors will be having for SEAS members, so you should get to sail in the 420's as well. Read more about Commodore's Cup to be held this Weekend. In the first cooperative event between the two sailing groups, Juneau Youth Sailing (JYS), held a dinghy seminar for SEAS members, to get us out on the boats and sailing. The winds did not cooperate for the hardy few who manage to get out to Funter Bay for a round of 3 potential races. The first leg on Saturday July 25th brought 5 boats to the starting line, Freebird, Sarah Jane, Loa’a Nalu, Lyric and RainDog. With light winds all but 2 boats managed to get around Pt. 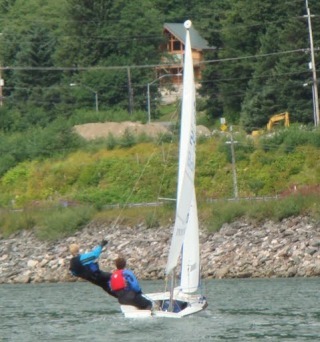 Retreat and had a pleasant spinnaker run to the Funter Bay finish line. Sarah Jane finished first in corrected time but Freebird the “big red boat” as we referred to her on the course, took line honors and showed that the she can really move in almost any condition. Leg 2 the first running of the Hanus Reef race was cut short when the wind disappeared just after the fleet squeaked past Rocky Island. Loa’a Nalu was the first to scratch with the whales of Pt. Adolphus calling. A week of cruising planned and provisioned, the decision was made to just keep going west. Sarah Jane and Lyric drifted for a few more hours and opted to take time to fish and relax back at Funter Bay.